Innovation for Pool Maintenance and Care! "Convert Salt to Chlorine Systems" - For Sale in Anguilla! You can experience significant cost savings and enjoy softer, more buoyant pool water with this system. Imagine if you didn't have to buy any more chlorine! Still achieve and maintain constant Ph and total alkalinity. No stabilizers are necessary…so you don't have to worry about hair turning green or red, irritated eyes. Pools are easy to maintain with a weekly litmus test strip. Save approximately US$500 per year in chemicals, depending upon the size of your pool. Recover your investment on an average pool in less than 4 years. Initial salt supply (which lasts years) is included in the package. Call for a free demonstration and quote. Installation and maintenance services provided by local staff. 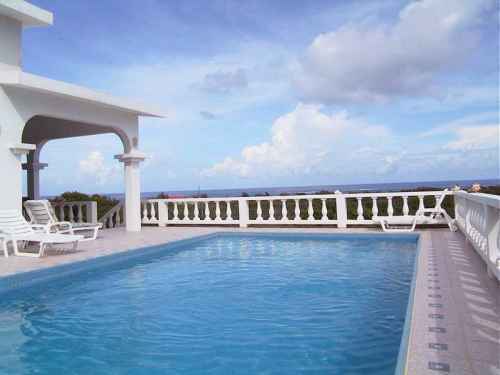 For persons on Anguilla you can arrange to view the pool at Casa Alfredo located in Shoal Bay. This pool has used this system successfully for several years. Casa Alfredo is located next to Cate's Data Dome on the Shoal Bay Road which runs at the back of Millie's Inn. Can also be viwed in Framingham MA area. Also, visit the web site for Casa Alfredo.